Have always wanted to try the W experience since W Singapore – Sentosa Cove opened but as the name suggests, it is located off the main island. Fortunately, there are four ways into the "State of Fun". They are by cable car, road (bus, car and taxi), Sentosa Boardwalk and Express. As I rather save the money on staycations for overseas trips, eating at a restaurant in the Starwood Preferred Guest hotel is the best option I have. However, it was only during my third attempt that I finally ate at Skirt. The first time, we went on a yatch from Oneo Marina Cove to St John's and Lazarus Islands. Upon returning from the trip, we checked out the restaurants at The Quayside Isle and W Singapore but did not dine at any of them. That was a few months back and earlier this month, we took bus no.3 from the bus interchange at Beach Station in the hope of finding a place to chill or for early dinner. 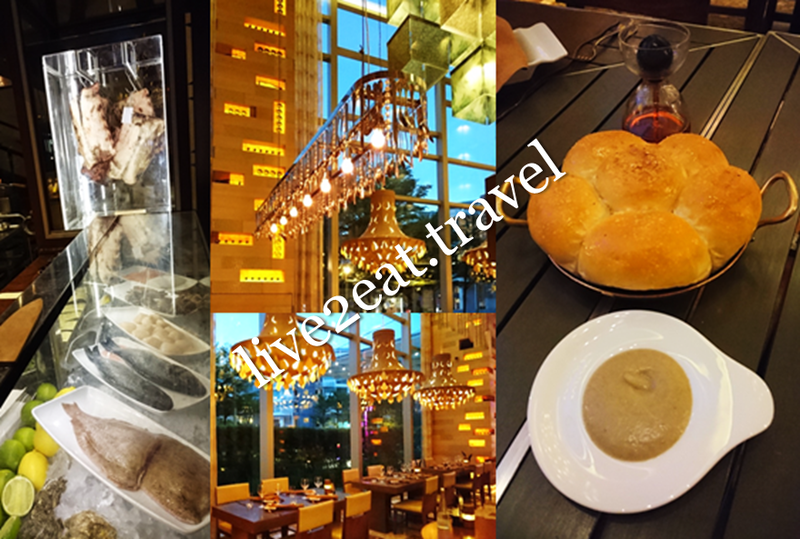 In the end, we settled on Syun at Resorts World™ Sentosa. Last weekend, my dining companions and I arranged to eat at the steakhouse and were seated immediately though we did not make a reservation. Finally, I thought to myself. 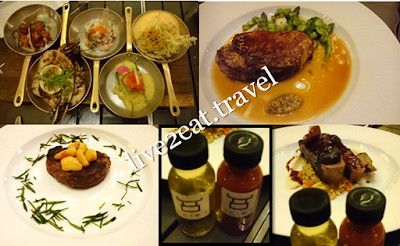 Ordered for sharing among four of us, a starter of SKIRT Seafood Platter and three mains – Iberico Pork Chop with green vegetables and mustard, Lamb Loin with Jerusalem artichoke and beetroot, Black Angus Grain Fed Black (Onyx MS3 Glen Innes) from Australia's New South Wales. Freshly-baked focaccia bread in the shape of a flower was served in a small pan with dips of olive oil with chorizo, and artichoke hummus. Soft on the inside, it was too buttery for my liking. While I usually eat my breads with olive oil and/or vinaigrette, did not like the taste of chorizo reminiscent of Chinese waxed sausage. Am not a fan of artichoke either. Starter consisted of five varieties, of which my favourite was the Crab Cakes with cucumber and spiced foam. Could neither rave about the Grilled Prawns and Scallop nor fault the Yellowfin Tuna Tartar with avocado and wasabi. Before our mains arrived, we were each served two small bottles – palate cleanser of apple bourbon, and homemade BBQ sauce to flavour the meats. As my dining companion did not want to see any blood on the pork chop, we had it well-done. A tad tough, the thick slab was cloying after a while. Both the lamb and steak were done medium and they turned out tender, though the former had a gamely taste and smell I did not enjoy. Whole garlics sat on top of our choice of 125 grams tenderloin (it also comes in 250g portion), which tasted flavourful with a smoky smell. Not impressed with any of the items we had, and service was mediocre at best.